Last week we asked if apprentices need formal qualifications, a question prompted by the government’s decision not to include formal qualifications in new apprenticeship standards. By way of context, the Trailblazer Apprenticeship programme was introduced to give employers the power to fashion training according to their needs and in 2017 the Institute for Apprentices was formed to give companies a stronger role in the leadership of the apprenticeship system. This included the sanctioning of ‘end-point assessments (EPAs)’ to evaluate whether trainees have achieved the required level of knowledge, skills and behaviours deemed competent by employers. Of the 590 readers who responded, over three quarters (78 per cent) agreed that formal qualifications are a required mark of competence. 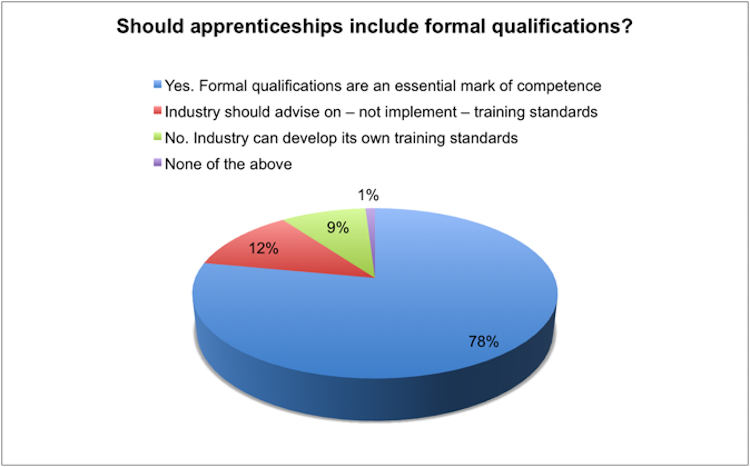 Of the remaining 22 per cent, just over a tenth (12 per cent) agreed that industry should advise on – but not implement – training standards, nine per cent thought industry perfectly capable of developing its own training standards, and one per cent couldn’t find a fit with their opinions, electing instead for the ‘none of the above option’. Considering the range of NVQ available then insisting on apprentices being trained towards a recognised qualification should be part of the scheme. If no expectation of qualification is placed on those claiming to be training apprentices then I expect there to be significant abuse of the scheme from unscrupulous employers. The problem is that “Apprenticeship” now covers a vast range of youth development, with good Engineering Apprenticeships at the top end of the range. And it has always been the case that some Engineering Apprenticeships are far better than others. We should make it easier for potential apprentices to compare scheme to scheme, including what formal qualifications are included, and to now which are going to give them formal recognition after apprenticeship. Due to the nature of the “slave labour” approach to apprentices in the 1970’s, I never completed my formal qualifications because the placements I received never gave sufficient practical support/reinforcement to the theory that was being taught to technician apprentices at the time. This has not prevented me from gaining other industry related qualifications along the way and attaining a reasonably proficient position as a Senior Product Safety and Environmental Engineer, acknowledged electrical safety specialist and In-Service Surveillance Manager for two major weapons systems, so the academic side of a technical apprenticeship is not (and never was) the be all and end all of everything. It has also been my experience that excess weighting in favour of the academic side of engineering generally leads to a level of practical ability that can border on ineptitude. I am sure others have had similar experiences across their lifetime/careers . . . I wonder if 83 % would be sufficient to persuade government to acknowledge the advice from engineering and manufacturing professionals, probably not. The UK is often quoted as being well down the education achievement lists and yet the statement is made that we are going to follow a course none of the better achieving countries adopt. Performance can be measured and a judgement made whereas an opinion of achievement will vary between the assessors. We need our politics to be driven by at least some people that have demonstrated they can produce good results at the coal face not just sit around a table and create idealistic scenarios that end up producing a poor result in the long term. Even with a full apprenticeship (4-year) and a plethora of NVQs, ONC and HNC, and signficant CPD, i have professionally found myself sidelined as I did not go to university….even though, my technical knowledge was vastly superior to the manager in question….prior to asking, I was a trusted adviser and idea bounce, after answering, I was engineered out of the department in favour of “Graduates”. Whilst – one would hope at least – this individual is NOT representative, the more formal qualifications that can be obtained, the greater the credibility of the individuals; especially in the eyes of potential bigots! That said, with some “full Engineering apprenticeships” now being completed in about a year; what hope is there for either situation…? In principle industry setting its own standards to suit individual business needs is fine. However, both employers and employees also want transferrable skills, which can only be carried out to external standards. Perhaps the emphasis should on the essential core skills (STEM) with industry taking on far more responsibility for training for their specifics. With the expectation that people have to move around in their working life and not expect lifelong careers in one place verifiable external standards are absolutely essential. In line with anonymous above the possession of specific skills should take precedence over bits of paper. I did a 3 year apprenticeship gaining a range of qualifications, followed up by part time university. Despite 25 plus years of proven skills and experience, the main criteria for my last job was the possession of a degree. A degree is not the be-all and end-all and with so many people having them or expected to have them what is the point? They are now devalued by the sheer numbers and selection reverts to the non-degree skill set to mark people out. So why bother with a degree in the first place? Skills based apprenticeships become more valuable, and in this context vocational specific degrees are merely another form of that. It all depends on whether the ‘apprenticeship’ is run by a hamburger chain or a high-tech engineering concern. For the latter, a four or five year apprenticeship backed by formal qualifications is essential to maintain industry standards and customer confidence in UK engineering worldwide. For the former, who gives a damn anyway? One problem we have in this country is the snobbish attitude to some jobs as exemplified by this remark. We need properly trained sales staff and service workers to complement and profit from our highly successful research and development professionals. Without them we will continue to have the ideas only to see others develope and profit from them. I started my apprenticeship in 1969 with Ford Motor Co at Halewood on Merseyside and did not see any “slave labour”. For the 1st two years we stayed in the apprentice school, 40 in each year, learning how to use millers, shapers, grinders welding equipment etc. and repair them. We did block release to college for C & G. Mine was the 1st year to do a 4 year apprenticeship but Ford allowed us to go to college for 5 years as long as we kept passing our exams. I could have transferred from the craft courses to the technical and it was my intention at the time to do so but at the end of the 5 years Ford GB only made £2 million, the same as the phone bill so that was stopped, previous to that we could have carried on until 27 years old & HNC. Now you see in the newspapers that even when we come out of Europe we will still need to be able to bring in people from the EU to fill jobs, Why. Because the number of apprentices & the like dropped to six in some years & zero in others. I worked for Ford for 42 years. Stop tinkering with the system, open the City & Guilds book and USE it give late developers who didn’t feel A levels made sense to them a route to degree courses if they want them. But above all DON’T allow short termest employers to cut corners on apprentices. I was an apprentice and went through a training as a “machinist” during the communist era in Czechoslovakia. Those three years in training were essential to my growth and has given me enough knowledge to pursue a carrier in tool and die making and eventually position in engineering department of successful injection molding company. It is critical for young people to have the opportunity and access to learning other than colleges and universities. Without my three years in basic training in the industry I would not have had the same chances for success. The rush to destroy engineering apprenticeships was all part of the idiotic and frantic misguided “Thatcher” determination to destroy all things associated with unions. The facts were that apprentices were not involved with the unions and were barred from taking industrial action. The nonsense that is now portrayed as apprenticeships is just that – utter nonsense. Highly skilled (time served) engineers are very clever innovative individuals. Their job is to make and support the tooling and utilities that are used to make the product. As such; they are continually learning and innovating in their constant search for better performance from the tools they manufacture. Very little of this knowledge is ever written down. These tradesmen are highly competitive and use these special skills to good use in demonstrating their quality in better product quality and longer tool life. This service is rewarded with rates of pay that are proportioned to individual performance. For an apprentice to be given to one of these top journeymen (toolmaker) was a great start to an engineering career. You would be privy to a great deal of information and unrecorded methodologies. Along with that you automatically grew some “respect” being attached to such a person. For your part you had to maintain a smart appearance, listen to everything, pass your engineering college exams every year; to fail a year, finished your apprenticeship. I just can’t over emphasize the importance of this relationship; you slowly metamorphose into a kind of replica. To destroy this link was to destroy the value of apprenticeships. These journeymen consider this personal knowledge as “part of their craft” and would never pass it on, or let it be made public. The exception was their apprentice. PS: Germany retained their craft apprenticeships. I comment elsewhere on academic and vocational linkage, but now have to add my wholehearted agreement to this comment. I was enormously fortunate to be an apprentice to Allen West & Co, and this gave me personal support during my first years after schooling. I was very vulnerable and suffered with ill-health, but very determined. AW gave me an irreplaceable opportunity to overcome personal difficulties, and I was able to resolve them andgo on to run my own Company . I really feel sorry for today’s youngsters in a similar situation, there would be no chance for them. Alex – couldn’t agree more. You write clearly based upon similar experiences to that of myself in the late 70’s / early 80’s when I fondly recall my ‘4.5 year’-Indentured Mechanical Engineering Apprenticeship (Aerospace Tier-1). Apprenticeship to me always meant and still do, time spent understanding both the principles & practice demonstrated firstly by skilled men (and a few women in my experience), alongside relevant academic studies: ONC/HND+ Endorsements (remember them?) such I could both undertake subsequently relevant calculations, draft geometric instructions and , if necessary, actually operate a multiplicity of workshop machines & processes to create 3 dimensional parts for prototyping & trials purposes. Sadly, I find ‘modern apprenticeships’ referenced to shop/retail activities or ‘traineeships’ lasting a matter of months which bears to true comparison to the time it truly takes to contribute to a professional role in most high-value engineering disciplines. Pity that engineers are so focussed upon making the world safer, cleaner & more accessible than going into government where most practitioners , academically at least saw ‘PPE’ , not maths & sciences , as the basis of their higher education. A better ‘balanced’ democratic parliament would, I believe, have longer term benefits for society as a whole but doubt if many lawyers or sociologists would concur. Would you wish a none indentured gas fitter to work on your home boiler or similarly an industrial electrician wire the safety circuitry on a press that had the power to crush you down to mm. I suspect we would all say: Never!. Then why is this idea even being floated. Standards need to be maintained and this can only be achieved with proper training and a testing regime. EITB governed training and craft apprenticeships, ONC, HNC, HNC. worked, so why have we being watering this down incessantly. I was lucky enough to be one of the last City and Guilds plumbing and heating apprentices (craft and advanced craft) in the 1980s prior to the introduction of NVQ’s. I was a late developer and if I had not been fortunate enough to get an old school apprenticeship who knows where I would be now. These days I am a facilities and safety manager in hospitality and I now find it hard to find anyone with real experience or skills for the most basic of shift maintenance job roles. There has been a serious under funding and lack of interest in apprenticeships over the last two decades. There are still old tradesmen out there with the knowledge and skills who could train and pass knowledge to youngsters the old way. The UK needs to seriously return to what worked ASAP, we need to train and retain our workforce, rewarding them appropriately as they progress and qualify. There are young people out there wanting to improve their prospects by the apprenticeship route, not everyone can go and do a degree, some need coaching and a helping hand. Most of the EU trade papers are not relevant in the UK so looking overseas has just been a smoke screen for greedy capitalism and low pay justification. The converse is also true. Formal qualifications without any practical aptitude are not, as the saying goes, worth the paper they are written on. In Germany there are more than 250 engineering , commercial and other types of apprenticeships and the government and industry spend a lot money trying to attract young people into vocational training . Apprentices spend three to four days a week at a company providing vocational training, where they aquire the practical the practical skills required for their field of work. The remaing one or two days are spent at vocational school, where apprentices receive a theoretical grounding in their future job. complete their training are often taken on permanently as a skilled worker. If they perform well in the workplace, there Is also the opportunity to train further to become a master craftsman or a state certified engineer and to rise to a managerial position. The majority of young people leaving school do a structured aprenticeship or go to college. Hardly anyone finishes up without some specialised vocation.In spite of higher education being completly free in Germany most go intially for an apprenticeship which always guarantees a job. The question should be: does government need qualifications? Yes, certainly , because the manufacturing industry relies completly on how many trained people are available. caused mainly through language problems with immigrant children . on the situation and how the are going to deal with it. 50 years ago apprenticeships used to come in many forms from trade through technician, thick sandwich engineering and graduate. All used to contain academic and in company training and even though they were offered by different companies all had an amount of commonality governed by the colleges, universities and the various institutions. This system provided the employers with a known standard by which to judge prospective talent and gave employees a high degree of freedom of movement between employers. I am amazed that anyone could even contemplate any system that does not include both. This does not mean that I believe (unlike past governments) that everyone needs or is indeed capable of obtaining a degree. There used to be different levels of academic achievements from ONC through OND, HNC, HND and degrees and these were applied depending on the individuals capabilities and needs. It was a system that worked and gave practical and academic learning. I cannot believe that a government could be so naiive to imagine that industries which should be providing wealth creating manufacturing could progress and grow with staff training containing no base for confident transfer of labour. In my opinion it is typical of career politicians who appear to have no idea of what is really required to make our value adding industries great again, I wonder what the industrial giants think. Has anyone asked the Rolls-Royces, Smiths Industries or British Aerospace what they believe? Reference Mr Ivan Taylor’s final paragraph: it is not only politician’s ignorance of requirements by engineering discipline, but a progressive loss of the experience by our society of working through practical tasks. Children used to gain such experience by construction kits and then formal skill training at school, plus a backgound at home of practical work. The absorption of what worked and what did not was continuous and progressive, and became a personal asset and a matter of pride in a skill. To the degree that this vocational skill could be integrated into an abstract concept by learning the quantification of, and calculations required to manipulate the physical elements comprising a project determines the insight required to “actually do the job” , which is a lack complained of frequently. Our education culture seems to value the intellectual aspect but is unaware of, let alone undervalues, the crucial need to develop and integrate a complementary insight which couples practicality and calculation. Because of the standards that each of us had to meet and maintain, our graduating credentials allowed us the freedom to go anywhere and be accepted. Is that they key to it? A piece of paper allows mobility. Without it you are left with a reference from a possibly dodgy employer or one that is too small to have the clout of Jaguar Land Rover and the other big players. Everything the government does needs qualifying. One of the strengths of the apprenticeship I served was the possibility of changing course as the student demonstrated his or her abilities. Courses included City & Guilds craft training, ONC, HNC, HND and external degrees. The local technical college worked closely with the employing company. We had quite responsible roles towards the end of our apprenticeships; indeed all the test departments were almost exclusively staffed by apprentices who had passed their ONCs at the end of their second or third years. Supervising staff in these departments were very experienced in using these quality control situations to teach theory in a very practical way : for example measuring iron and copper losses in transformers to check they met specifications reinforced our college lectures and coursework. I think it is important not just for Industry, but also for the apprentices themselves that some form of formal qualification is part of the program. Receiving a qualification gives a greater sense of achievement, of personal value, to someone. They can see that their worth is recognised and measurable, and sets a baseline from which to develop themselves further. And we all know the difference between a worker who feels they have value and one who doesn’t…..
Who would you ask within those firms? I know, lets ask HR: they are really ‘tops’? No, lets ask the marketing department: no, they will do or say nothing which would upset their primary customer(s) -the military! and HMG who spends our money buying ‘their’ kit! So, lets ask the Engineers. Heavens sake, that would mean actually accepting that ‘they’ actually know what is necessary: and as we all know, these are men (and sadly mostly so) with dirty oily overalls, a piece of cotton waste in their pockets and a spanner in their oily greasy hands: and of course they are un-educated and with no brains! Further to Michael Kenwards comment I think he makes a superb point; why do we as a country accept career politicians? It should be mandatory that no-one can become a politician without having held a proper job in commerce, industry, finance or other profession, in this way at least they would have some idea of what it is they are governing and why and what impact their decisions would have on the majority of peoples lives. I cannot think of any other sphere of life today where individuals can reach the pinnacle of their profession without having served some time dealing with the practicalities and impact of their decisions. Perhaps there should be a recognised apprenticeship scheme for politicians. WRT Ivan Taylor’s comment – yes! a brilliant idea, but could parliament function with only a handful of people? I suspect that most of today’s politicians would not be in the job today if they had needed to go through an apprenticeship scheme first; or would their scheme be ‘suitably adjusted’ by other politicians to ensure they always got through. Me, a cynic? An apprenticeship for Parliament? [Why not for all the rest of those described by the author of 1984: George Orwell made the comment in the 30s that “far too many at the summit of and within our society were from the ‘wholly unnecessary’ groups: those who simply make work for themselves and each other (of their groups! )” And nearly 100 years later, they are still there, still getting in the way of progress, still looking back for precedent rather than forward with inspiration….I have my list, lets hear yours? true apprenticeships are those that are one day release to a long college day and the name should restricted to starting on the manual traditional skills that require determination to master. The problem is that the government is not really interested in whether apprenticeships are worthwhile or not, just as long as they are seen to create lots of them. As far as they are concerned apprentice and apprenticeship are just buzzwords; They are in the news and we need lots of them, hardly anyone knows what they are, but everyone knows they are wonderful. Therefore the government can have a vague policy that allows companies to set their own apprenticeship standards and enables companies like Morrissons to be the largest apprenticeship provider in the country with its 6-week shelf stacking apprenticeships. How else could they possibly achieve David Cameron’s pledge to create 3 million apprenticeships by 2020? “In Germany there are more than 250 engineering , commercial and other types of apprenticeships and the government and industry spend a lot money trying to attract young people into vocational training . ” And I read yesterday that the new US administration (and presumable our ‘Right-eous’ followers) is complaining bitterly to Merkel that Germany has a positive trade balance with the US of $450,000,000,000 per annum. Might those two events be related? Removing the academic element might be good for the employers who are signing off their own apprentices but not I suspect for the apprentices themselves. There is also an element of companies not wishing to allow day release in order to generate more work out of their apprentices. The risk is that the apprentices are being short changed and slightly exploited by these changes. Besides which, the academic element gives the apprentice something that is universally recognised and not just recognised by the company that awarded the qualification. It is also a demonstration that the apprentice understands the theory behind their learning. Plus it is a gateway into academia for those who may wish to go on to do a degree. The politicians seem overly concerned with getting headline grabbing numbers signed up to apprentice schemes- but the risk is that these schemes are devalued if the academic rigor is removed. Instead of aiming to have the most apprentices we should aim to have the best apprenticeships. Far too many MPs (primarily of the Right but the others hang in there!) did have (and still do practice) a previous activity from amongst the “conflict groups”: lawyers and military – the vicars have been eclipsed almost! Party political cabals are supposedly the training ground and apprenticeship aspect of joining political life…but ‘learning from Nellie’ -watching what other operatives were doing – was being rightly challenged in the 60s: and most effective industries ditched such decades ago. We (or at least our apparent leaders and betters) seem to be stuck with a situation that was showing failings in the 1600s (hence Oliver Cromwell’s “Get out, Go…” approach). But as long as our leaders see winning the next election as the sole purpose of their actions….. Although many people believe that passing a formal examination is no longer necessary, I have to ask whether anyone is looking to an apprentice passing his apprenticeship and then deciding to go into a branch of his or her trade or profession which may well call for essential theoretical knowledge that would normally have been covered by the aforementioned formal qualifications. If something is not broken then why on earth are people so determined to fix it? !